Are you decorating (or plan to decorate) your home? 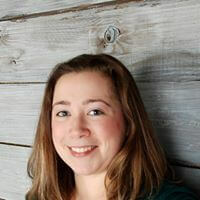 Well then let’s talk design! More specifically, design mistakes. Because I’ve made a lot of home decor mistakes myself and I’d like to help you not make them if at all possible. So, let’s talk about some of the biggest design mistakes to avoid in your home. Believe it or not, most of these are common mistakes that many of us make in our decorating journeys. If you have made some of these, hopefully you’ll enjoy a good laugh. And if you haven’t, hopefully this guide will help you be conscious about these mistakes moving forward. Painting is one of the easiest-yet one of the hardest-ways to freshen up your home. While it’s inexpensive and straightforward, choosing colors gets tricky. And it’s not surprising why: Benjamin Moore and Sherwin-Williams alone offer over 5,000 paint colors! But unless you want your home to look like a circus tent, you’re going to want to narrow down your paint color choices to a few. Make your home flow by picking a general color scheme for the whole house and playing with variations. For example, In our home we have navy blue walls and tan furniture in our living room and tan walls with navy blue curtains in the nursery. Doing this helps the home flow without it feeling boring. Many of us (especially first-time homeowners) get so excited about decorating our home that we just try to do too much. As a result, we buy too much decor and our home looks cluttered and confused instead of decorated and intentional. 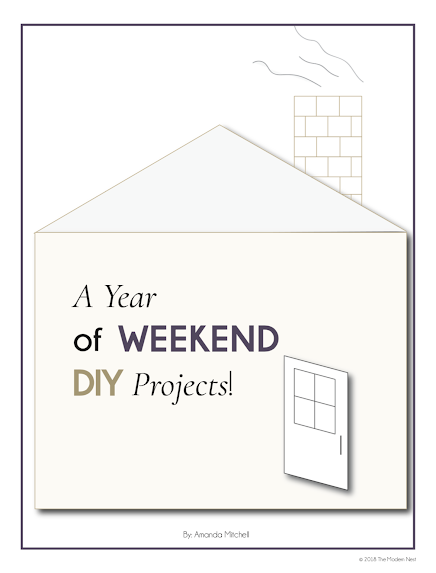 If you’re just starting out in your home decorating journey, take it slow! 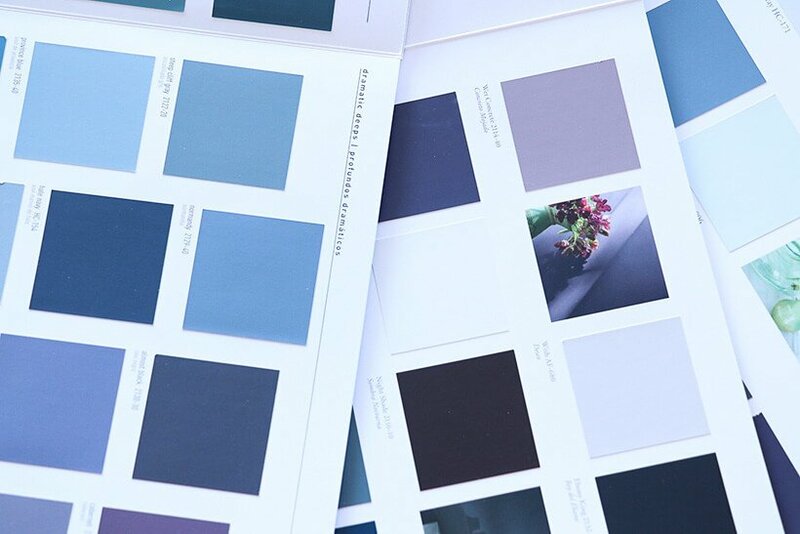 Put together a mood board to guide your decor-buying decisions. Then buy just a few pieces at a time. Re-evaluate your space after you work on one small section of a room and then work on another section. You’ll be surprised about how much you’ll change your mind on pieces you thought you wanted but that ultimately turn out to be unnecessary! A well-designed room has balance to it, and that includes furniture placement! Putting all your furniture against the walls not only makes a room look unbalanced…it’s an inefficient use of valuable space! Practice rearranging your furniture so that you use the middle of the room as well. For example, try arranging your kid’s bed so only the head is against the wall rather than the whole side. Get creative! After all, you can always move it back. 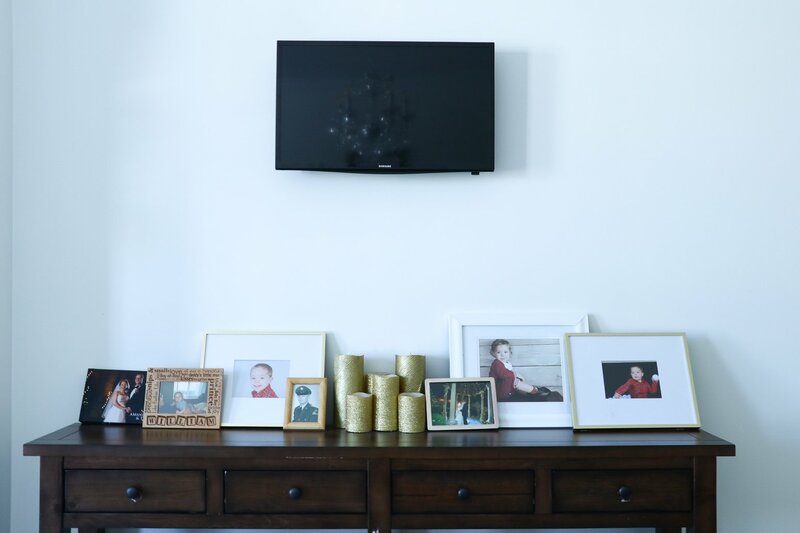 Before (top): exposed wires from the TV add visual clutter to the space, making it feel less appealing. After (bottom): snaking the wires through the wall reduces the visual clutter and makes the space feel more appealing. I’m looking at you, pesky wires! It’s always a shame when an otherwise beautifully decorated room has visual clutter standing out that just…takes away from it. My suggestion? 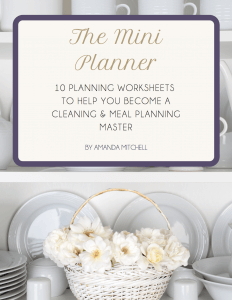 Take a wander around your house and write down what looks off or cluttered. 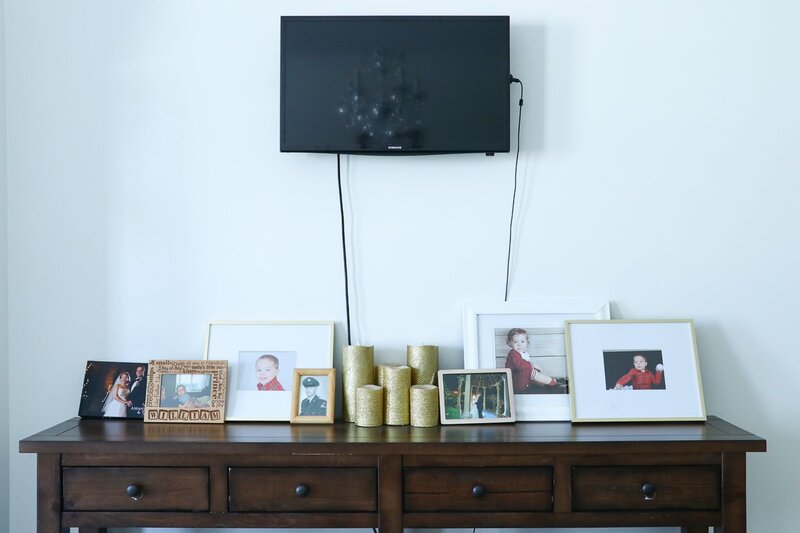 You’ll find that all the wires behind your TV, the magnets covering your fridge, the awkward kids’ toys, and overflowing baskets are invading your otherwise nicely decorated house. Once you’ve identified the sources of visual clutter, brainstorm solutions (you can read more about reducing visual clutter here). It might entail a simple task such as organizing the papers on your fridge or something more involved such as snaking your electronics wires through the wall. Whatever you decide, tackle it in bite-sized pieces! Decorating a wall adds a sense of completeness and personality to a space. 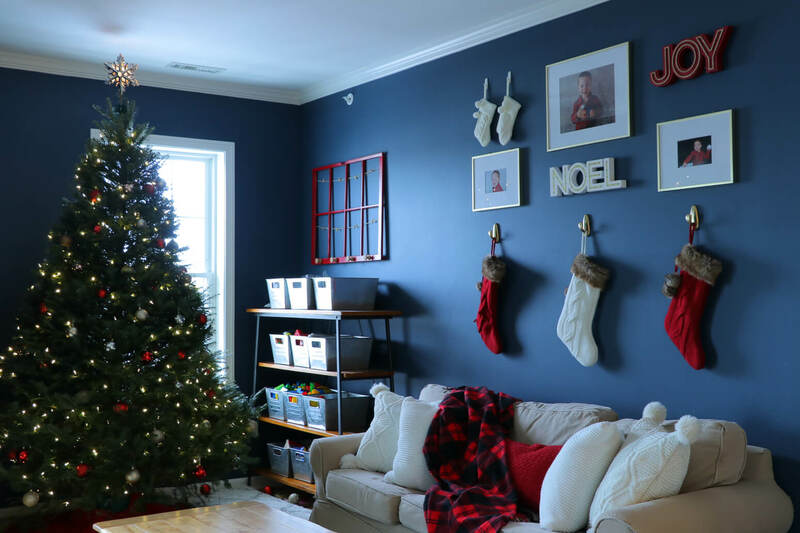 Here our living room wall was turned into a Christmas gallery space that also added holiday cheer! Have you ever been in someone’s house or bedroom and felt like something was…missing? More often than not, it’s because their walls had absolutely nothing on them. If decorating your walls seems scary, start slow. Pick one room to work in and then find some art that you think will work well. You don’t have to spend a lot of money! In fact, in my home I often start with what we already have! For example, our “office” lives in our bedroom, so I used our diplomas to decorate our “office wall” and distinguish that section of our room! Pay attention here! If you’re on the market for new furniture, make sure you choose furniture that fits the space appropriately! I’ve seen many people choose a couch or a bed because they love the way it looks, only to find out that it’s disproportionate to their space. And unfortunately, returning or changing furniture is a much bigger hassle (and expensive) than dealing with smaller decorating mistakes. Don’t do that to yourself. Before you commit to any furniture, make sure it will fit the space by marking out the area with painter’s tape. Leave it there for a day or so while you walk around and visualize it. If you feel concerned that it will be too big or small for the space find another piece you like and repeat the process. Once you do this a few times you’ll have a better idea of what size furniture will fit the space appropriately. OK, I made this mistake several times when we first bought our home. Coming from boring beige apartments for almost a decade gave me the urge to go bold when I finally owned my space! As a result, my home looked way too…loud. If you feel ambitious to go bold in your home, take a step back. Resist the urge to make everything bold. Instead, pick one element of your room that you want to use to express your personality (an accent wall, a piece of furniture, or even a fireplace). Alternatively, choose one bold color and sprinkle it throughout the room with accent pillows, lampshades, wall art, etc. 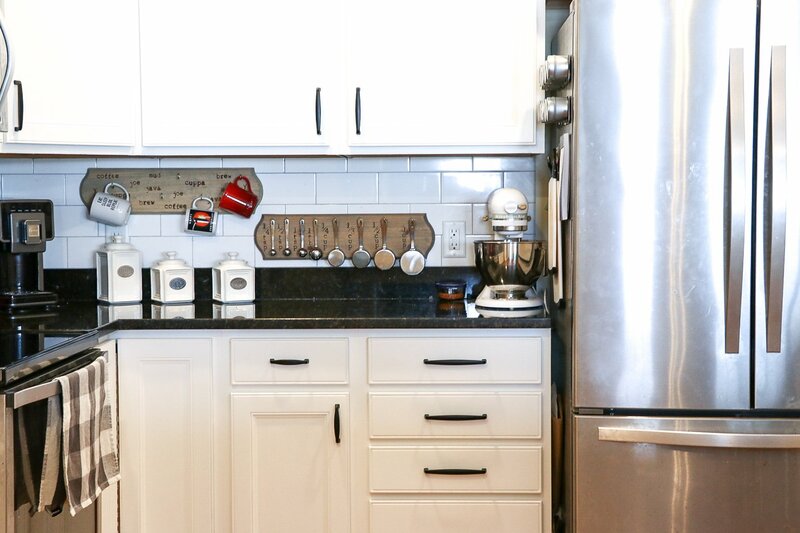 This kitchen is white but still has lots of character with contrasting hardware and counters, decorative canisters and rustic wood storage pieces. You can find the tutorial for the wood mug and measuring spoon holders here. On the opposite side of the spectrum of going too bold is not adding anything with personality to your space. While the desire to keep things “safe” is understandable, having no visual interest in the space will make it look plain and boring. Fortunately, there are several ways to add some visual appeal to your space no matter what your tastes. You can add pops of color, mix up patterns and textures, add art, etc. The possibilities are really endless! Remember to go “up-and-out” when hanging curtain rods. 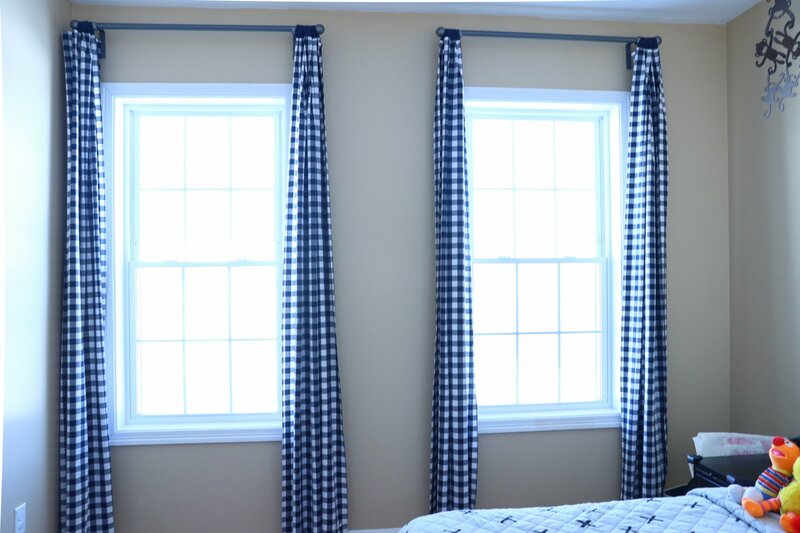 Hanging curtains away from the window frame makes the windows and space look bigger. In addition, making sure the curtains clear the window itself when they are open ensures that maximum natural light can enter the room. Curtains are one of the best ways to add wow factor to a room, but they have to be done right! Unfortunately, many people put up their curtains so that they kind of “hug” the window frame. This does the room an injustice because a-) it makes the window look smaller and b-) it minimizes the amount of natural light coming in (because the curtains don’t clear the windows when they are open). You can fix this problem by using what I call the “up-and-out” rule of thumb. In other words, mount your curtain rod at least a few inches above and a few inches out on both sides of the window frame. The exact measurements will depend on factors such as how you want your curtains to fall and how full/thick they are, but a good starting point is ~2-3 inches each side of the window frame. Getting lighting right can be tricky. Start by having a few different light sources, such as a ceiling fixture and a few wall-mounted fixtures (as shown here) or floor lamps. Play around with lighting arrangements, dimmers, shades, etc until you get the look and feel you want in your space. Many of us think of either having “enough” or “not enough” light when it comes to our spaces, but actually having the right lighting makes a huge difference in the overall feel of a room! 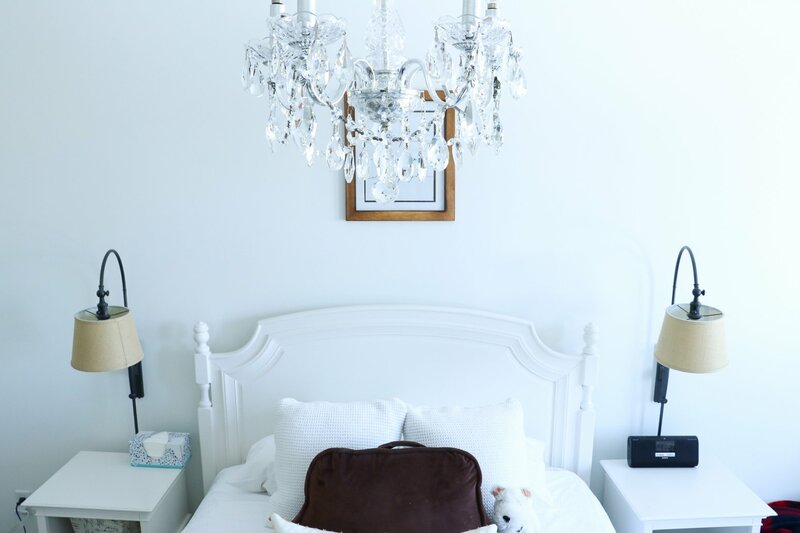 Unfortunately, making the lighting just right can be tricky (or expensive) if you live in an old home with poor electrical wiring or have young children (there’s something about floor lamps that attracts little ones). But you can generally at least make improvements to your lighting. For example, you can add dimmers if you find the lighting too harsh or add a wall-mounted lamp to your space. You can also try changing lampshades or trying a new bulb. Play around with it! There you have the biggest design mistakes to avoid in your home! I hope these tips inspire you to take your home decorating to the next level! Just remember to move slow and steady, and your house will become home you want it to be! 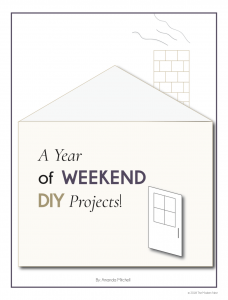 Want more DIY and home decor tips? Check out 8 simple tips to paint like a pro, inexpensive tricks to make your old home look new again, and decorating rules to break today. I loved the ideas. I just moved in a new house and can’t wait to us them. Thank you.